So when my husband and I were still considering purchasing our home and we walked through, we did not see the broken windows and missing screens. In fact, we missed the following: one broken slider that had one of the panes in one of the panels shattered and missing, garden window with a hole the size of a baseball with shards of glass resting in between the two panels, a dining room window with two cracked exterior windows, a living room window with one panel cracked on both panes and of the 8 windows and sliders we have downstairs only 3 have screens and those needed replacing due to holes. The upper windows were all intact and screens in place but many were tattered and torn and also needed replacement. Now in our defense, there was a large dog in the backyard which prevented us from going outside and seeing the exterior of these windows, the plantation shutters were closed and we already knew the floor plan so we probably were not looking as close as we should have. Regardless of the reason, we missed them. The first time we had an inkling of them being broken was when our inspector pointed out that we had broken windows. It wasn’t until we were cleaning the place and it was a bazillion degrees outside that we discovered how bad the situation was. We began pricing replacement and repairs. Replacement of just the broken windows was reaching over $3,000 grand and repair really wasn’t much different and that did not include labor or screens. So sadly, I would have to live with broken windows for a little while and save. 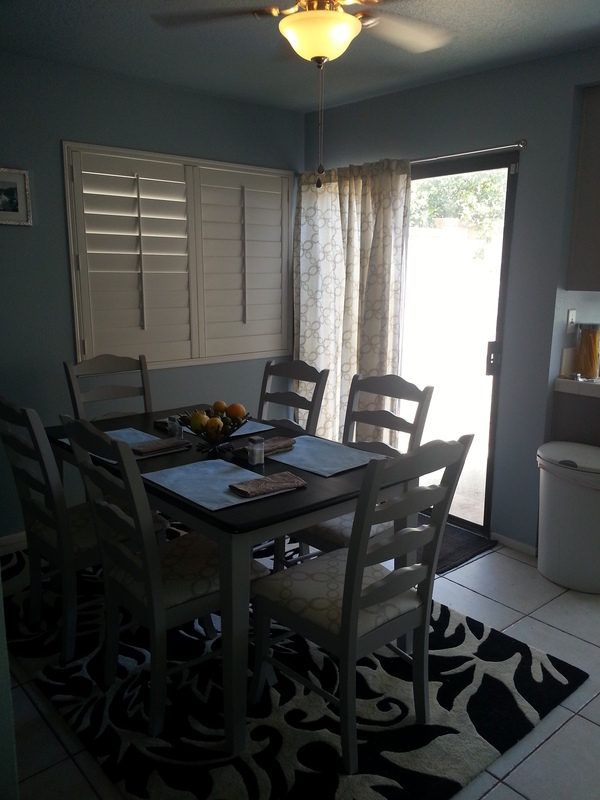 But, I had two eyesores that did not have plantation shutters to hide their damage. I needed options!!! First, I needed to deal with the heat pouring in through my windows. Second, I needed to cover the broken portion of my very large garden window. Third, not only was my slider no longer a double but the other side had gotten moisture in between the panels and had developed an ugly fog. Curtains were the perfect solution!!! 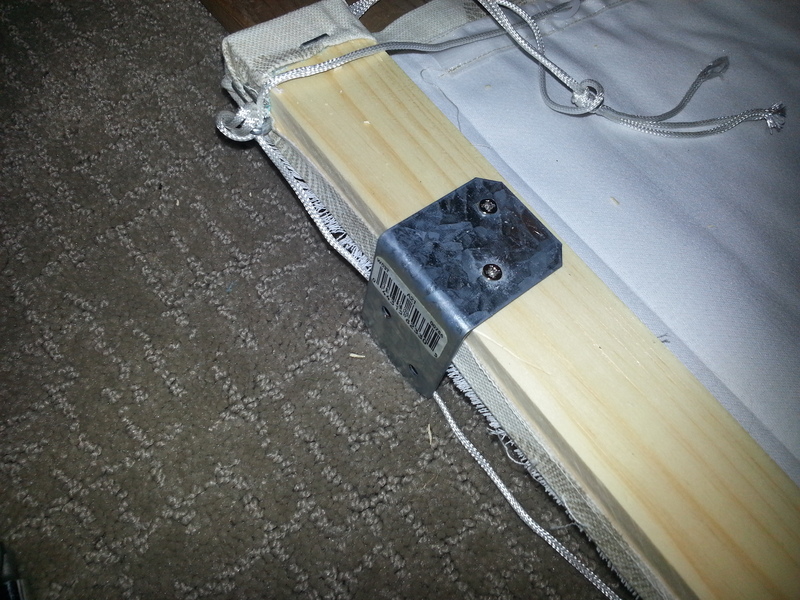 I knew I wanted a modern looking simple pull curtain for the slider either using tabs or grommets. And I also knew I really wanted a roman blind for my garden window. 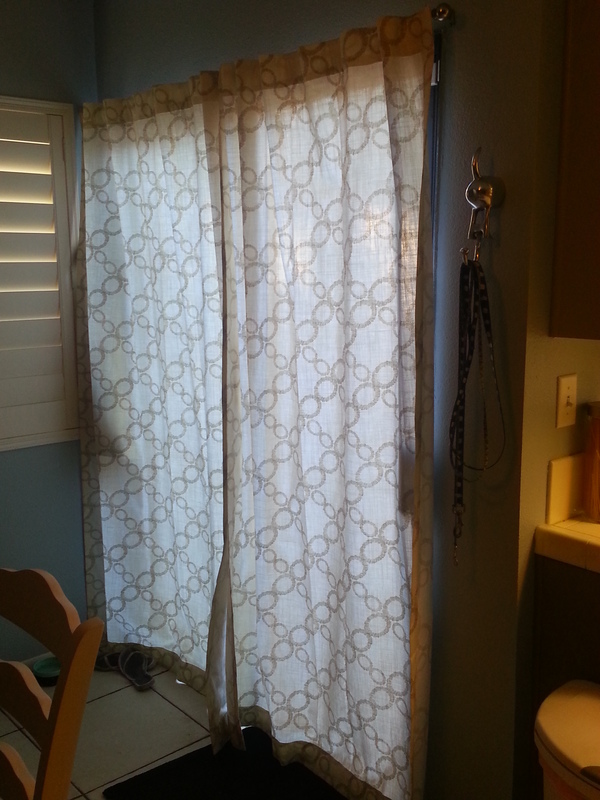 I believed it looked more modern, more masculine and less frilly than most of the valances I had seen and I really didn’t have the space to do a traditional curtain. But, do I make them or do I buy them?? So I started pricing material at JoAnn’s and Mood and a few other places. The best price I found was $6.00 a yard on sale. I really liked the fabric. 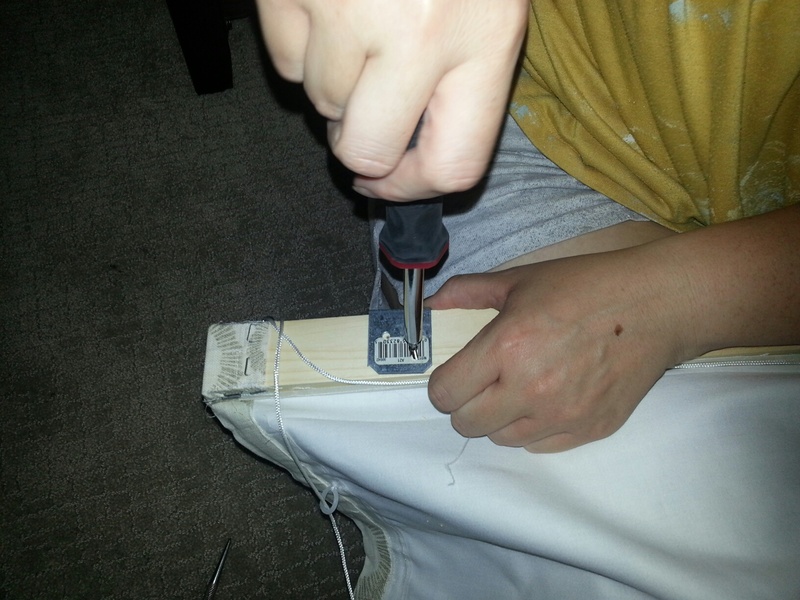 However, by the time I finished buying the backing, thread and material we were looking at about $100 plus dollars for two slider curtains and a roman blind. I also wanted to recover chairs with the accent fabric so I wasn’t wasting material but it also meant that I needed a little more. A little more material also means a little more money. I also began pricing curtains at Bed, Bath, and Beyond, Anna’s Linens, Target and more. BBB and Anna’s had beautiful choices but they were expensive. And still needed a roman blind to match. I checked Target but none met my size requirements. I also went to three of my FAVORITE places to spend my paycheck – TJMaxx, Home Goods and Marshalls. The challenge was they were hit or miss. I might find one set of panels I liked but I needed at least two 50” wide panels and an extra to complete my roman blind. I was starting to feel a little downtrodden. God intervened. On my back-to-school shopping journey, randomly at TJMaxx, I found 4 panels of the perfect fabric from Tahari Home and both sets together were less than $60 including tax. The really cool part was there was enough material that I would be able to create the matching roman blind, and, though not ideal, I even had enough to recover my chairs…trust me when you see my chairs you will understand why I wanted them changed. One of the things that had been left behind that was salvageable and was actually in good condition was a brushed nickel finish curtain rod with round bulb brush nickel finished finials. Between that and these awesome tab-backed curtains, my slider fog dilemma would be solved. Now where to hang it. I have always followed a general rule of thumb when hanging curtains. “Hang them wide and Hang them high.” What this really means is, ideally, you want to your curtains so when they are open, the leading edge of each panel rests just on the inside of the window frame and the curtain rod should be hung close to the ceiling-wall edge. Not only does this arrangement allow for the most light to shine in when opened BUT more importantly it makes your window look taller and wider than it really is. However, in the case of my slider, I couldn’t hang it farther out than the frame as there was no wall space and I elected not to hang it all the way to the ceiling either. I had a plantation shutter right next to the slider on the opposite wall. So in order to create symmetry and unify the space, I elected to hang the curtain rod at the same height as the top of the planation shutter. In doing this, my panels became too long. Shortening would be needed. Tip: I’m not planning on moving anytime soon but nothing is guaranteed in the future. So instead of cutting the bottom off and re-hemming the curtain, I elected to fold the curtain up and sew a new hem. A simple straight stich will work for most projects. If by chance I move and the windows/sliders are a different height, then have haven’t lost anything. I can just undo the hem and unroll to the old height. Now for the roman blind. I am not a sewer. Beyond a straight stitch and the occasional missing button, I try to stay away. I don’t have the patience, especially since it is something I don’t enjoy. I have always believed in working in your strengths. Sewing is not mine. So I went to the best sewer I knew…mom. She really is awesome and I will have her do a guest post in the future on her Roman Blind because it’s pretty cool! I did however make sure there was enough material to construct the blind and provided the dimensions. Knowing where you want it is almost as important as knowing what you want. Once constructed, it was up to my husband and I to install. One challenge when you make something yourself, you also have to figure out how to get it in place. Start by determining where you want your brackets. If using only two, then they should be secured toward the outside edge. I positioned the other two toward the center to add stability. You will need to unfold the beam so part of it is exposed as shown in the picture. Since we were putting the blind outside of the frame of the window, we needed the brackets to for an L so the one end was flush to the inside of the window frame and the other end pointing up outside the frame and cinching the wood beam between the L-bracket and the wall. It is important to distinguish whether your blind will rest on the inside or outside of the frame as it determines how your L-brackets go on. 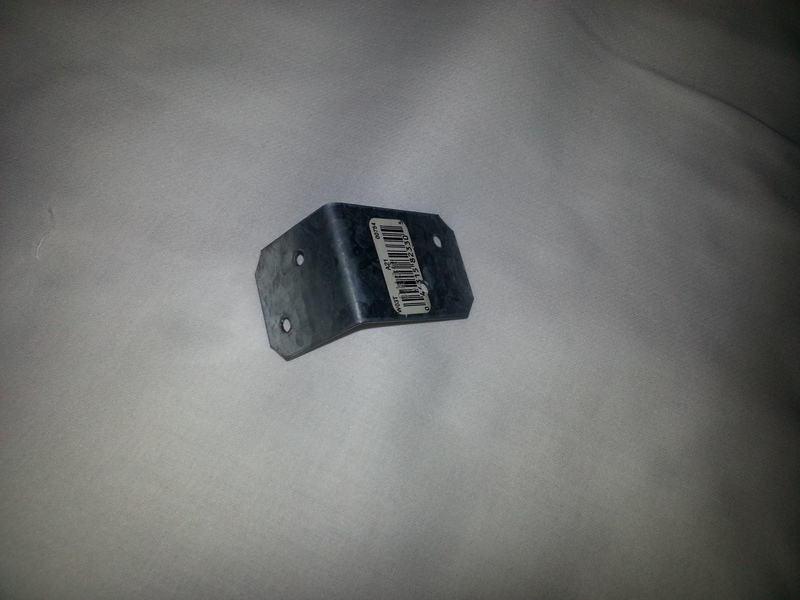 Once you have determined location, mark the holes using the L-bracket as a template. Then drill pilot holes for the screws. 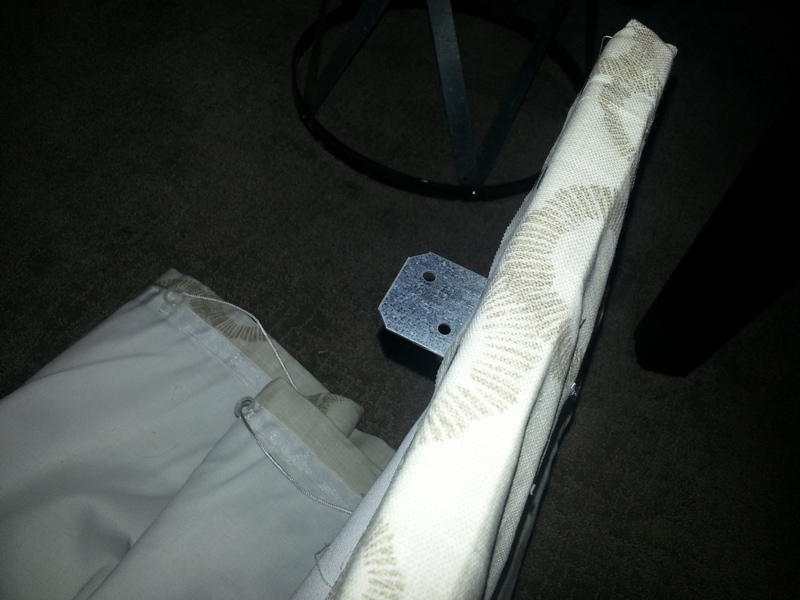 Align the holes with the L-bracket and secure with your screws. The L-Bracket I used had one side longer than the other to make sure I had enough space to cover the wood and still reach deep inside the frame. 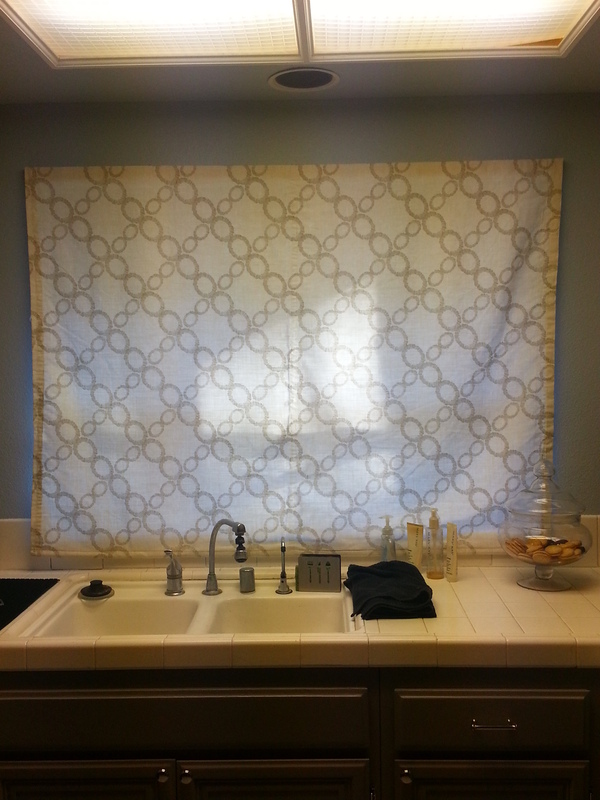 It’s a team effort to get this blind up…hubby drilled and I screwed. L-Bracket secured and in place. Its hard to tell but the protruding part of the L-bracket is underneath the beam. Putting it up was definitely a two person job for us. 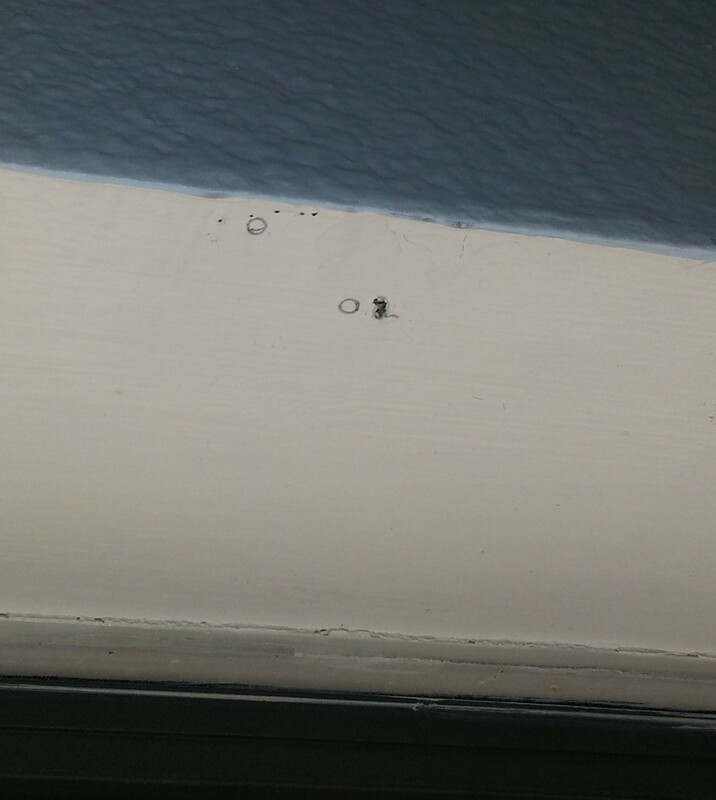 One of us held the blind in place so the other could mark the holes. 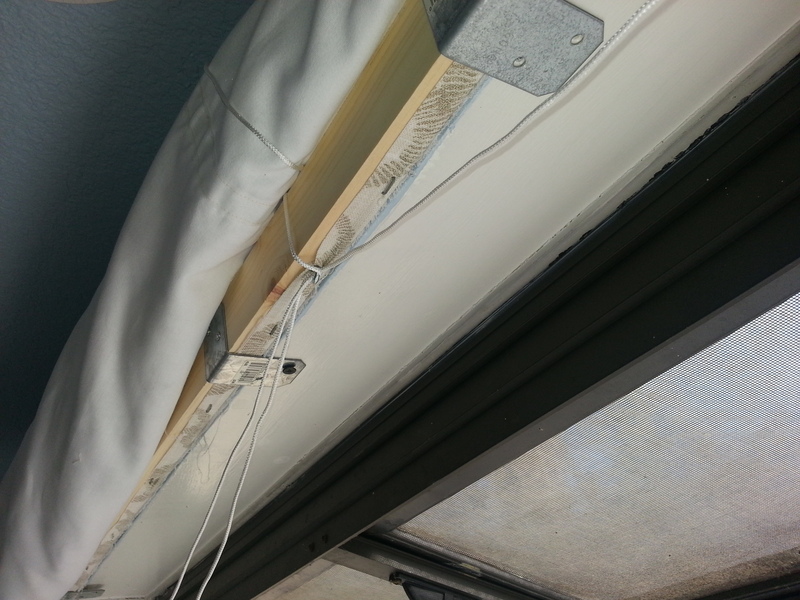 As before, we predrilled the holes and then secured the blind in place with the screws using very long drywall screws. Since it was a window frame, finding studs were easy. In the case of something you will be pulling on, studs and screwing into studs is essential. The last things we needed to do was install an awl or hook to wrap the cord around when the blind gets opened. I suggest putting this in an inconspicuous location on the inside of the frame. 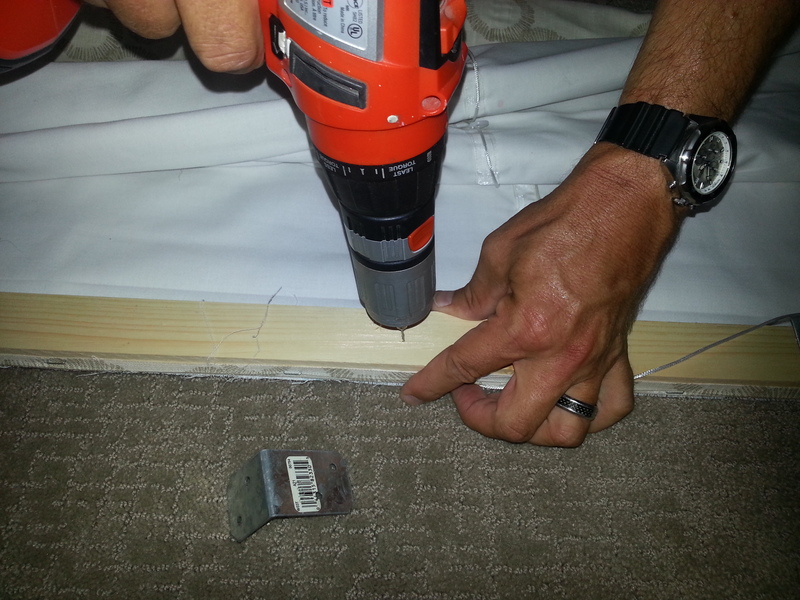 Once pilot holes are drill, use drywall screws to secure in place. Note how the L-Bracket forms a vice of sorts between the out “L” of the bracket and the wall. This baby ain’t go’in no where. Adding curtains added softness to the room full of harsh materials and edges. It stopped some of the heat from penetrating and it hid the ugly. I think they look pretty good. What do you think? Pingback: TDK – Temporary Dream Kitchen: Country Pine Chairs Restyled and Recycled | Wife, Mom, House...Oh My!